I love looking and always looking for some inspirations to inspire me in my kitchen. I am kind of a non-veg and vegetarian meal person. Meaning, I can survive just by consuming vegetarian food (not too long though). I find it a challenge to always try and come up with something new and different to enhance our daily palette. Indian food and recipes has been adorning my kitchen for some time now. But me and Tarun are planning to change our diets by incorporating some Asian (Chinese influence) and Indian recipes. I am from Malaysia, a land of multi-colored society. We are blessed with the opportunity to learn and sample a vast variety of dishes from Chinese cuisine, to Thai to Indian and Indonesian palettes. Chinese cooking is by far my favorite in terms of dietary values and vegetarian recipes. 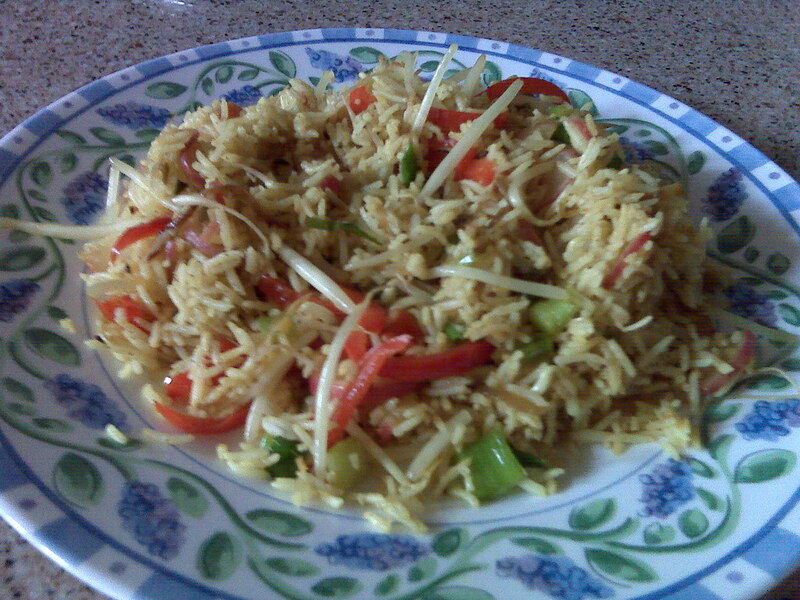 So I came up with a recipe of mix vegetable fried rice, with some Chinese umph and Indian kick added to it. Let's begin cooking, shall we? Add cooking oil into a searing hot wok. Fry the onions till lightly brown, add turmeric and garam masala powder. Proceed to add ginger and garlic paste. Then add green chilies, red bell pepper, radishes, lite soy sauce and cracked black. Stir fry for a minute. Finally add rice, scallions, mung bean spouts and salt to taste. Mixed vege fried rice is ready in 10 minutes! Serve hot! Go on, try the recipe and let me know how it turned out. Try adding or substituting varieties of vegetables such as carrots, green capsicum, green beans etc. Enjoy cooking! i see that ur a fan of the pioneer woman too! she has some pretty cool recipes on that site of hers! u too cook ..everybody cooks .. :( except me ..
>>> Thanks Lemonade. Yes, I am a fan of Ree from pioneer woman. She is a hilarious writer, and it's fun to read her blog. And most of her recipes looks yummy. I've tried some of them, and they are pretty simple and no fuss. >>> Hi Arvind, thanks for dropping by my blog. It's a domestic duty for me to cook! :D And a requirement for a wife. Don't worry, dhere dhere tum bhi sikh jao ge. Enjoyed reading the link you sent on your haute cuisine adventures! It's hilarious. Do drop by on my blog again.